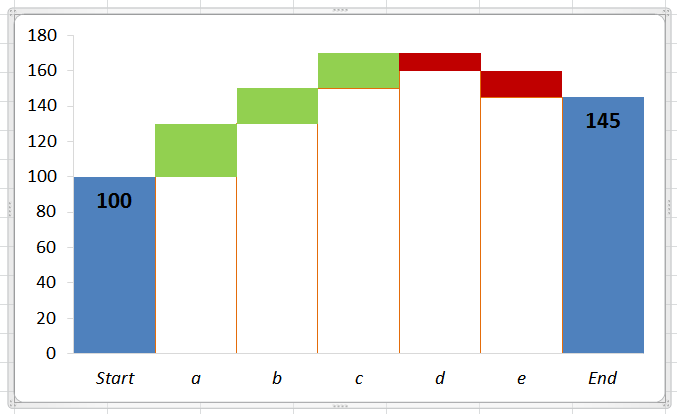 In the screenshot below you can see I have made all sorts of changes, including making the borders of the hidden series visible, so you can see that this waterfall chart is basically a stacked bar chart with no gaps between series, and did this without going up to the Ribbon once. (I am not suggesting the formatting of the final version is better, in fact the opposite is probably true, I simply wanted to make several changes to demonstrate the new feature). While this is not quite as instantly available to use as the tear-off colour palettes used to be in Excel 2003 and earlier, it does go a long way to replacing that functionality, and has the slight benefit of remembering the last choice made for most items so you can easily apply the same colour to axes and gridlines, for example, or the same fill colour to two related series (font options show the current value for the selected element, rather than the previous choice, and this makes good sense to me intuitively). One minor niggle with this mini-bar is that you can’t move it, so it can obscure the things you are changing, so you should right click in the chart area near the top edge to avoid it getting it the way. Helpfully, formats which don’t make sense get greyed out, so you can’t use fill colour for lines, which reminds you that the formatting option for “outline” applies to any element which consists only of lines, such as the axis, gridlines and so on. Have you used this new feature already? Have you discovered other small but valuable features of Office 2010 (or earlier versions)? What are your favourite time-saving tips? The return to double-click to edit is certainly welcome – this method is also great, especially when elements are hidden under something else or not visible. It is certainly a step back towards the convenience of 2003 in this area. I’m always amazed by users who don’t realise they can choose elements from a drop down list, whether on the old chart toolbar or the new ribbon, and painstakingly select things with the mouse (or fail to do so, especially if they are using ‘clever’ techniques which rely on invisible series). I’ve seen fairly advanced spreadsheet veterans waste loads of time on this. Same as scrolling through loads of worksheets instead of right clicking on the lower left arrows to jump to where they want to be – not obvious until someone shows you but then a huge timesaver and really easy to remember and use. Easily overlooked even after years of daily use.